I’m always impressed by the images that come back from Mars Express’ High Resolution Stereo Camera (HRSC). This new one released a few days ago (below) is no exception. 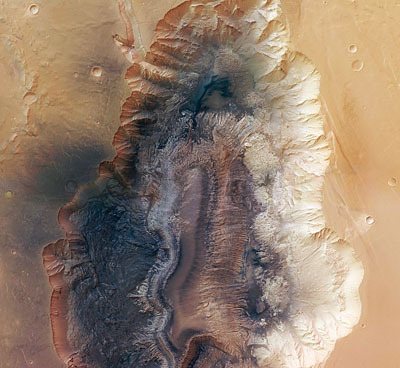 It shows a region called Hebes Chasma, a vast gauge into the martian surface around 8 kilometres deep! The incredible feature is located just above the main canyon on Mars, the impressive and truly staggering in size (3000km long! ), Valles Marineris. Each pixel in the image corresponds to 15 metres on the martian surface. Scientists studying the image believe it shows evidence of landslides, depositions and other hints of a terrain shaped by erosion, large-scale geological activity and water. In fact recently the spectrometer on-board Mars Express detected signs of water-bearing minerals around Hebes Chasma showing that there have clearly been, according to ESA, “significant quantities of water” there in the past. To see more images as well as the high-res versions visit the ESA page here. 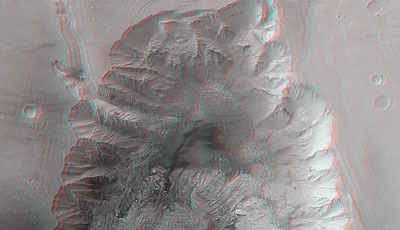 If you have got some 3D specs then have a look at the anaglyph below to see Hebes Chasma in perspective. Also a quick mention to thank all the people who came to my Hubble talk in Torquay on the 20th. It was good to visit Torbay again and to see many faces from the Torbay Astronomical Society which I haven’t seen for a while. I’m going to be heading over to Belfast on Tuesday for a few days for the Royal Astronomical Society’s National Astronomy Meeting 2008. When I get a moment I will post about some of the fascinating discoveries and announcements that always come up at NAM. It seems I will be in good company! Absolutely breath-taking, isn’t it? The images that are arriving are almost beyond words and complete understanding.